Power must be available, thermostat commanding a higher temperature, the blower cover in place to close lock-out, etc. The inducer is a small blower mounted above the burners. It evacuates burned gases into the flue. There is a tube that runs to a pressure switch. If the switch doesn't detect the right threshold of pressure, it will lock out the furnace starting. The limit switch is for high-temperature safety. The igniter is a semi-ceramic glow device that burns hot enough to ignite the natural gas/ambient oxygen emitted from the burners. The flame sensor is no longer a thermocouple. Instead, it uses the water in the flame to make circuit contact with ground indicating to the furnace control that the gas is burning--without which, the gas is cut off for obvious safety reasons. Called in Nathan Gause (who lives nearer than his father, Jim) to fix it. The igniter was $60 and the service call $80. This furnace is some 10-20 years old and needs to be replaced. However, to save money, we allowed Jim Gause to replace the inducer (?) which ran us about $400. A replacement quote for $2.5K-$3K was given, but we're going to try to put it off for a couple of years. Condensate overflowing onto floor. Purchased new pump and replaced. Due to miscommunication, Nathan Gause ended up performing the replacement. I enquired about replacing the whole furnace which dates back to 1995. He told me a number of interesting things. Also, the refrigeration component is far more efficient. The 12 SEAR system we got was the best money could buy back in 1995. Today, however, you can go all the way to 22 SEAR. But, he says that you can't get the better performance to pay for itself. A 16 SEAR system will pay itself back in 3-5 years. He says that heating and cooling would work cheaper and better for the house after the replacement. No more chimney ducting would be necessary for a new furnace. It takes air from inside the basement to burn and expels it--cooled--through cheap PVC conduits (on our new house, I have pre-run these knowing that someday we'll need them). Basically, things that are very dangerous to the house, like furnaces, refrigeration systems (air conditioning) and water heaters, are first-rate quality because they have to be. This is required or they cannot be sold. Gas-fired water heaters like we use can now have flammable liquids literally poured all over them and they will not ignite them: your house is safe from fire caused by any combination of water heater and gross owner stupidity. Conversely, says Nathan, washing machines, dryers, dishwashers, etc. are not dangerous (i.e. : do not pose particular safety hazards to the the home). Consequently, these appliances are becoming more and more crap and have to be replaced more and more frequently. Nathan says furnaces are a bit smaller now too. And he confirmed with me that it would be a good idea when we do replace the furnace to choose one that will mount up on the ceiling of the basement putting it higher than the house drains. This would eliminate the problems we're having now. It would also give us more room down there--floorspace to put things. Last, he and Jim both do HVAC. It's nice to have honest people to rely on. I wish all tradesmen we had to deal with were so. Barrel with top collar and set screws assembled, retaining collar installed. Legs deployed, right-side up on a flat surface. Lift the center of the legs to open a "hub" and insert the barrel, top collar with set screws up, into the hub made. With channel locks, snug the fins of the legs up tight against the barrel. Because these have deformed over the years, the retraining collar's arrow markings are no longer useful. Push the large retaining collar down the barrel over the leg fins, catching these between the collar and the barrel. It's this contact that holds the entire stand together. Seat the retaining collar as much as possible to the legs. I purchased this from TigerDirect for $189 plus $15 shipping on 12 December 2015. Disappointing, but somewhat enlightening installation video. Couldn't get my cheap &frac38;" crimper into space. Had better (rented) ½" crimper for tight space. I pressed &frac38;" ring into ½" ring then fit the two over tube and tube over coupling, then crimped using ½" crimper. It was hard to squeeze the tool, but it worked and the connection appears not to be leaking under pressure. I really need to buy some good PEX tools, but except for a flurry of heavy use 3-4 years ago when I participated in rebuilding my folks' duplex rental, I really can't justify it. I'm discovering that &frac38;" PEX, though what they used in my house (2002) except for washer and hose bibs, is simply not used anymore. It's ½" and ¾". 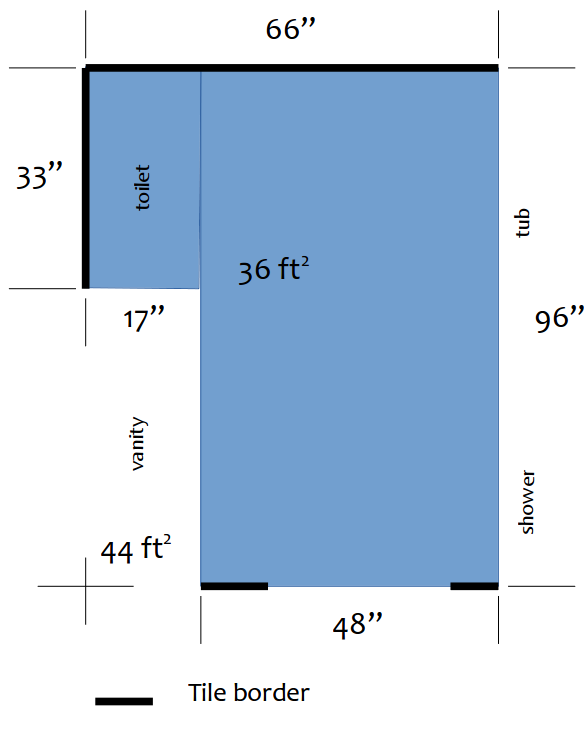 Total area tiled: 36 ft2 Linear total of tile border: 114"
...in August, 2016 with a horizontal-flow unit ($3K+) that freed up a lot of real estate on the floor in this house. ...with super great unit ($8K+) and thermostat. Somewhere, I wrote a long document with more detail, but I can't find it. I've done this successfully for two doors that already had springs and for one door whose springs I replaced with new (but the wrong-sized) ones. This procedure was noted when I once worked with a technician to install a whole new door and springs. Note: the door will not operate very well with the wrong sized-springs. It may operate adquately for use not including opening all the way or getting a vehicle in and out. This was my case until I fixed the problem. The symptom is usually that the door can't travel its full course without the cables coming off their drums and/or that the door will not remain closed when down and/or that it's too hard to lift or too hard to keep down and closed. To keep the door closed, use the locking bar (if present) and/or a pair of ViseGrips® clamped on either (or both) tracks over a roller. The number of winds isn't mysterious. You need exactly one complete spring winding per foot of door travel. Most residential garage doors have 7'-tall openings. Often, the installation manual will tell you to add an additional, fractional turn. I think this has to do with adding additional tension, but I don't know. In any case, and especially with the electric opener present, it's crucial to get this right or wear if not damage will result for the opener and entire mechanical system. What are the parameters of the springs? You must know these before buying a replacement spring set. Always replace both springs even if only one is broken. (Rarely if ever will both springs break at the same time, but better operation comes from both being the same age, especially near their end of life.) From Amazon, a pair of springs comes with two winding bars for circa $70. Often, they take as long as 3 weeks to arrive even if you pay extra for faster shipping. A technician will typically charge $200 (2016) to replace your broken springs. It's not especially hard or scary to install new springs if you follow instructions. There are good videos and write-ups on the Internet. I immediately wrote this set of steps after helping a technician with a new, insulated door I bought to replace an old one (a two-car garage door, 16' wide × 7' high, for which I paid about $1500 installed). Note that springs and drums are marked with black or red paint marks so you know which side they go on. Sometimes these are associated with "right" and "left," but I'm pretty sure that those appellations are from the point of view of standing outside the door. Yet, logically, you perform the work from the inside. Just ensure that you note which end of the bar (or rod) has which color markings on its drum and spring and don't confuse them when you reassemble the bar, drums with cables and springs. Wind up the left (looking from inside) drum with its cable. Secure the drum by its set screws. Lock ViseGrips® on the bar against the ceiling or wall so that the drum cannot unwind. In other words, so that the bar cannot rotate around upward as you see it. Wind up the cable with the right drum and secure with its set screws. Remove the ViseGrips®; the door should be lighter now because of the spring tension, but, if the springs are the correct ones and are wound the correct number of times for the door (7' × winding &plus; additional, fractional fudge per door installation instructions), the door should remain lightly closed, easy to lift, easy to pull down, etc. If the last instruction does not represent the state of the door and springs after installation, undue effort will be required of the garage-door opener (assuming present) and ruin it quickly. Moreover, the entire mechanics of the door installation including track, rollers, cable drums, cables, etc. will suffer and fail prematurely. Visited the house a couple of times based on complaint that the furnace wasn't coming on. Opened the furnace, found it clean, the burners fired up each time. The second time, I reprogrammed the thermostat for Dad who wanted it 74° all day and all night. On the third- or fourth time, we called Jim Gause who found it to be the flame sensor and fixed it by rubbing it with some light sand paper. Once upon a time this was the thermocouple and we usually just replaced it. Jim said that this sensor can cause intermittant problems that are hard to diagnose.